Allard Auctions is holding their annual sale in Seattle to wrap up their 2016 auction calendar. On Monday December 12th, 2106, Allard will be hosting for online bidding on iCollector.com 300 Lots to chose from. 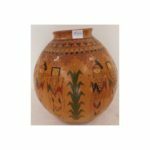 This collectible sale features Native American and Western items to suit a wide range of interested buyers. There will be everything imaginable from beadwork to pottery, artwork to jewelry, great baskets, and much more. All items will sell by auction to the highest bidder with an international audience of online bidders and a great live audience at the auction room. This is just in time for holiday shopping and bidders will have time to receive their treasures before the 25th. A basket not to be missed is up for grabs at Lot 322. 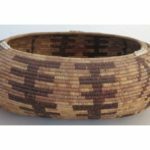 Presented is a Pit River Basket from the 1980’s. 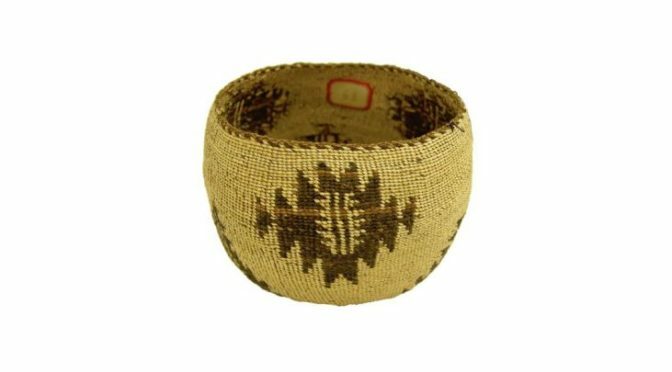 This is a rare globular basketry bowl with top knot symbols and a unique horizontally woven serrated diamond display of figures. Opening for only $300 this is in very good condition. This great buy comes from the Judge Bonner Collection and measures a great 6 inches by 6 inches. There is a selection of beautiful photos in the online catalog. Just a few lots later bidders can get their hands on a Plains Style Quilled Bag opening for only $375 at auction. Found at Lot 329, this is from the late 1900’s. The bag is an outstanding smoked buckskin pipe/tobacco bag with quilled body and slates featuring eagle figures. It also has sinew sewn and lazy stich beaded accents and a long fringe. In excellent condition and shown in the array of photos, this bag measures 27” by 7” not including the fringe. Special to the Northwest Coast, is a mask from Sakie James. At lot 400 is a colorful hand carved and painted “Golden Eagle” wood mask. This is in very good condition and measures 14 ½” by 10” by 9”. The artist has signed it including the location of “Vancouver, BC”. This is an outstanding example with vibrant colors and ready for display. Bidding opens at a hard to believe $300 and the high bidder will take this treasure home. Monday December 12th, 2016 will begin with live bidding at 6PM Pacific Time. Absentee bidding is available through any computer or mobile device right up until auction day. The full catalog is now online for inspection with multiple photos for every piece. 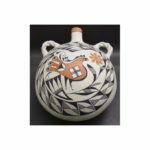 Allard Auctions is proud to present this auction and are happy to answer any questions via email or telephone in anticipation of a fantastic sale.